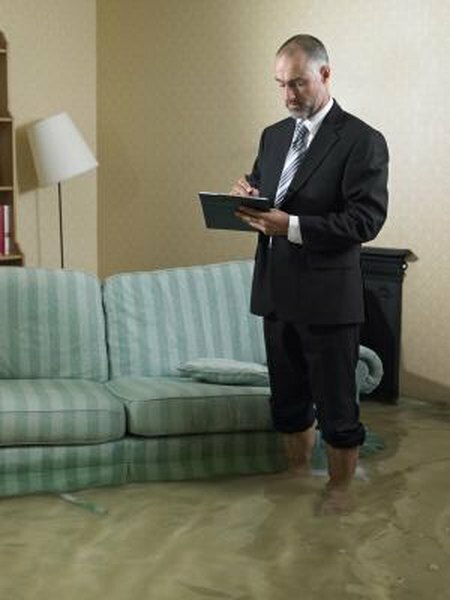 The insurance adjuster will take notes regarding all of the water damage in your home. An insurance adjuster is a professional who estimates how much it will cost to repair your home's water damage. Your insurance company will send an insurance adjuster to your home as part of the claims process. The amount your insurance company compensates you is based on his estimate. You can also hire a public insurance adjuster for a second opinion. No matter who employs them, however, homeowners insurance adjusters should thoroughly investigate all water damage claims. Your insurance company should communicate with you promptly and clearly about its claims process and the role of the adjuster. It should contact you a few days after you file your claim to tell you when the adjuster will be arriving. The company should also give you the name of the person working on your claim, so you can contact her if you have concerns about the adjuster. The Texas Department of Insurance recommends scheduling the adjuster to come when you will be home so you can answer questions about the damage. Your insurance adjuster should use a moisture meter to pinpoint which areas of your home have been exposed to water, instead of limiting his investigation to areas that are visibly damaged. According to water moisture meter manufacturer Delmhorst Instrument Company, walls, sub-floors and other below-the-surface areas may harbor hidden damage. The adjuster should also use his moisture meter to assess the moisture level of areas that haven't been affected by water damage to establish a baseline. Insurance adjusters must pull up baseboards and assess carpet padding and finishings for damage and wetness if moisture meters have indicated that they could be damp. Wet carpet, padding and insulation are ripe areas for mold growth. According to the Centers for Disease Control and Prevention, indoor mold has been linked to respiratory problems and the development of asthma in children. For this reason, your insurance adjuster will need to examine these areas to determine the cost of preventing mold. States have deadlines for water-damage claims investigations. For example, the Texas Department of Insurance says Texas insurance companies have 15 days to accept or reject your claim once you have provided all requested information. Because of this, and because water damage remediation should begin right after the damage is done, it's proper procedure for your insurance adjuster to visit your home as soon as possible, although it might take a few days for him to get to you if there's been a disaster in your area. Once he's completed his investigation, procedure dictates that he report his findings to the insurance company immediately, so it can issue your claim payment quickly. Will Homeowner's Insurance Cover Sump Pump Failure? What to Do If an Insurance Company Will Not Pay a Claim? Will Homeowner's Insurance Cover Mold Problems? Can I Make a Claim to My Homeowner's Insurance if My Chimney Leaked and Caused Water Damage?